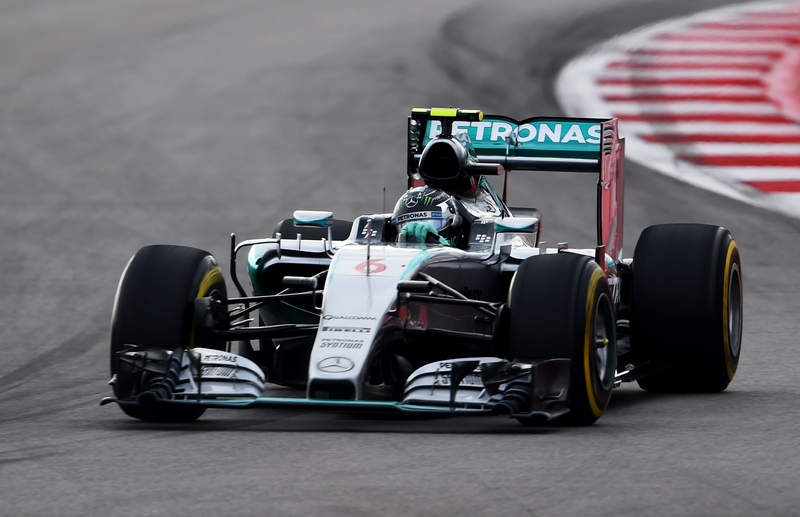 Nico Rosberg has taken pole position for the 2015 Russian Grand Prix at the Sochi Autodrom. The German driver topped every session of qualifying to take pole by 3 tenths ahead of team-mate Lewis Hamilton. Finnish driver Valtteri Bottas took 3rd, with the Ferrari drivers just behind. The drivers and teams were woefully under-prepared as they headed into qualifying for the 2015 Russian Grand Prix. The most amount of laps done by a car in dry weather was 19 due to the washout of practice yesterday and the early end to FP3 earlier in the day after Carlos Sainz’s heavy crash. At least Sainz’s condition wasn’t on the minds of the drivers after he Tweeted just before the start of the session saying that he was okay and that he was trying to convince the doctors to let him race. Carlos’ team-mate Max Verstappen was one of the first out on track along with the two Manor’s of Will Stevens and Roberto Merhi. Roberto was back in the cockpit after Alexander Rossi took his seat in Singapore and Japan. He’ll be back on the sidelines for the next Grand Prix in the United States. Unfortunately he didn’t manage to out-qualify his team-mate after swapping places with him throughout the session. The pair will start 18th and 19th. It was announced later in the evening that Carlos Sainz has been given permission to start tomorrow’s race, he will start from the back having not qualified. Only 2 other cars were eliminated due to Sainz not participating in the session. A late session fight between the Sauber and McLaren drivers ended with one driver from each team being eliminated. Jenson Button put in a very late lap to lift himself out of danger, but Fernando Alonso was unable to replicate his team-mate. He would be eliminated along with Marcus Ericsson in the Sauber. Alonso will move to the back of the grid after various component changes to his Honda engine. Mercedes were 1st and 2nd in the first part of qualifying, with Lewis Hamilton 2 tenths down on his team-mate. Rosberg continued to hold the advantage at the start of the second session, with Hamilton having a very poor first lap. He managed to put in a great 2nd lap that put him 6 tenths faster than Nico. He wouldn’t remain on top for long, with Nico’s 2nd lap putting him 2 tenths clear once again. 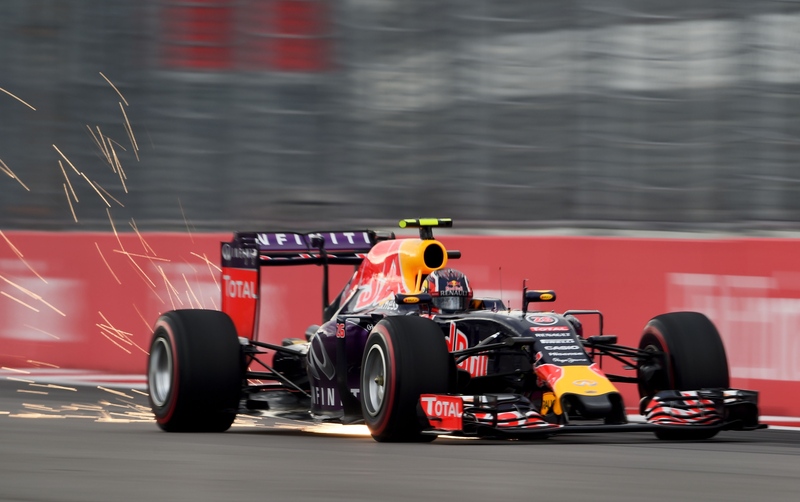 Daniil Kvyat was hoping that he would be able to advance to Q3 in front of his home-crowd. Last year he managed to put his Toro Rosso in a superb 5th on the grid, but he was in danger of not making it beyond Q2 at the end of the session. He was sitting in 9th place and was less than 2 tenths ahead of the cut-line as the checkered flag came out. Felipe Nasr and Daniel Ricciardo had both been in the drop-zone but they both improved and pushed Kvyat down into 11th. Max Verstappen then came through to push him down into 12th. Daniil was the last driver to set a lap in the session, but it was just shy of a tenth too slow. He would be eliminated in P11, with Nasr, Button and Maldonado 12th, 13th and 14th. The shock elimination was Felipe Massa, who appeared to have a car problem that meant he couldn’t match the times of his team-mate Valtteri Bottas up in 3rd. With Rosberg looking very much like he had the upper hand, Hamilton would have to take the fight to his team-mate if he wanted to take pole position for a second year in a row in Sochi. Once again, it was Nico Rosberg who took first blood after setting a 1:37.113. Hamilton couldn’t get on his team-mates level on the first run, as he remained 3 tenths behind. Hamilton tried to bridge the gap with his final run, but a mistake at turn 13 meant that there was no way he could beat Rosberg. He abandoned the lap, as did Rosberg, and that was that. Nico Rosberg took his 3rd pole position of the season by 3 tenths in a great style, topping every session of qualifying. 3rd on the grid will be Valtteri Bottas, who once again showed great pace in Sochi as he did a year ago. 4th and 5th went to the Ferrari drivers, with Sebastian Vettel beating team-mate Kimi Raikkonen by 4 tenths. 6th and 7th went to the two Force India drivers, with Hulkenberg ahead of Perez. Next came Romain Grosjean, with Max Verstappen putting in a great performance to take 9th on the grid just hours after his team-mates’ crash. The final spot in the top 10 belongs to Daniel Ricciardo, with both Red Bull drivers behind their junior team driver Verstappen.